For all the horror that Hannibal depicts, it often looks so beautiful that it’s hard to look away. (I imagine that’s one of Hannibal’s strategies as well.) The set design contributes as much to the story as any plotline, and it can reveal more about the characters than one of their therapy sessions. 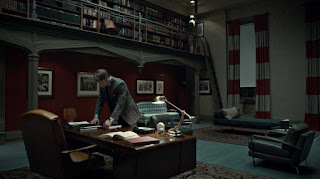 I picked a few of my favorite interiors on Hannibal and examined them and also what they mean for the characters and the show. This bathroom appears in the pilot of Hannibal and sets up the whole series visually. It’s a callback to the horror movie The Shining—in the movie a different Jack goes there to talk to ghosts. But even if you haven’t seen The Shining, the stark contrast of the red and white is unsettling, and the cold materials are harsh and unforgiving. The red is reminiscent of the blood that you know Hannibal will spill. Jack is in the middle of murder investigations, and he’s in over his head. 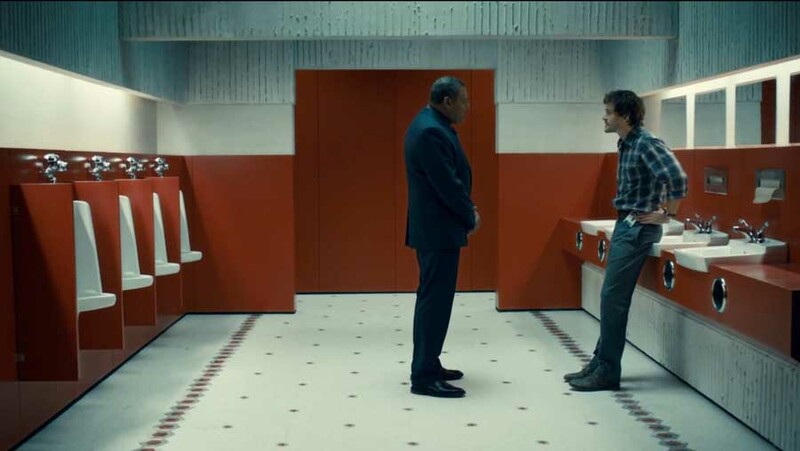 Will tried to wash his hands of it, but as long as he’s involved with Hannibal, he’ll never be totally clean. The show also uses the same framing over and over again when people are talking to each other. The characters face each other—like a doctor and patient at a psychiatrist’s office, perhaps—as they grapple with facing their own inner demons, and the demons outside in the world. Everything in Hannibal’s home is designed to dazzle and impress so that visitors get too overwhelmed with beauty and details and don’t see the monster that lives within them. 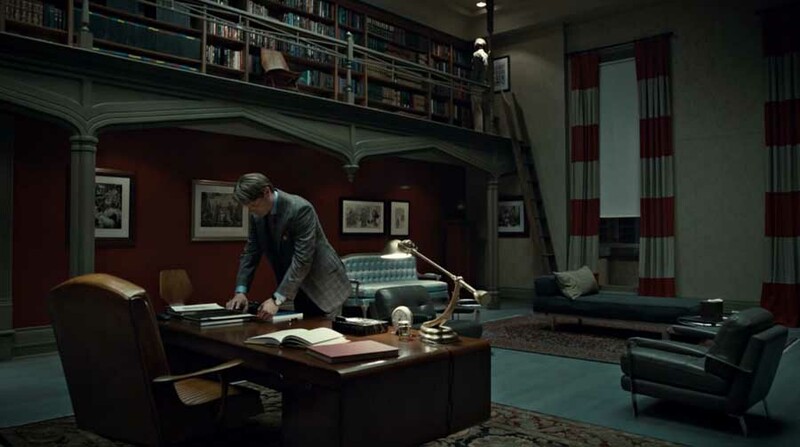 Hannibal does his research in every venture of his life, and decorating his home is no exception. He pulls from different centuries and design theories to make up his space, and his home appears more as a museum, where what it’s like to be human is on display, rather than a comfortable, welcoming home. Hannibal’s dining room is where he really puts on a show and he hosts lavish dinner parties to serve his guests... um, particular cuisine. It's clear that he takes pride in his flair and deception. 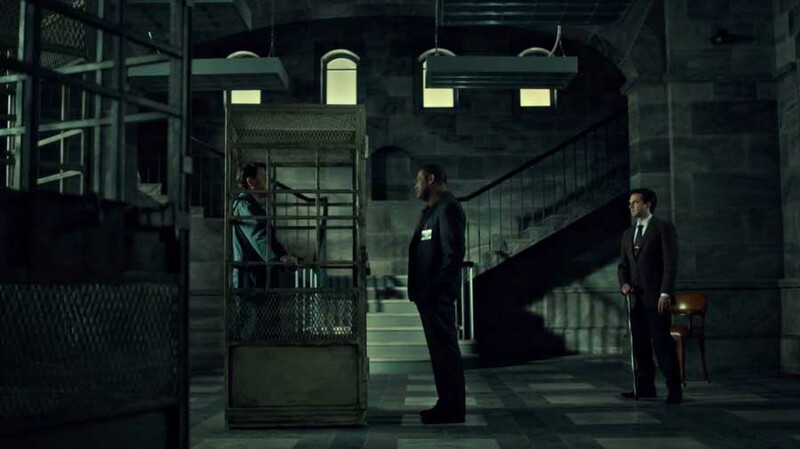 The walls are dark, and they envelop the guests, as Hannibal’s own darkness has taken over his life. 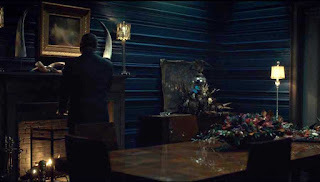 Antlers and horns are a recurring motif in Hannibal, and they are a nod to the animalistic ways Hannibal has killed people and the visions that Will sees when he is trying to solve the crimes. Will has visions of a Wendigo, a half-man, half-beast creature (often depicted with antlers) in Algonquian legends that can possess humans and craves eating human flesh. 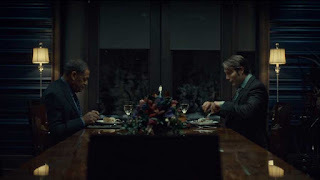 Hannibal may be possessed himself, but it’s just as likely that he’ll get into others’ minds and try to make them crave the same proclivities he does. 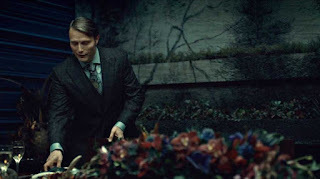 Even amid all of the death caused by Hannibal, there is also growth. He eats who he kills, which contributes to his body consuming nourishment (though not the kind I’d prefer), and he often feeds his guests. He also has a wall in his dining room that houses shelves of living herbs, which I’m sure he picks fresh to use in the meals he prepares. Hannibal is able to hide his true self within all of the contradictions he presents to the world. 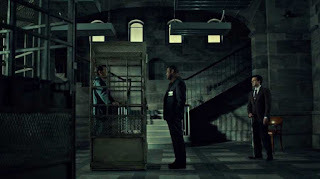 While Hannibal’s house is dark and dramatic, Will’s home is warm and light. These two characters are opposites in many ways, and their homes reflect those differences. The stones on Will’s fireplace and the blue of his walls reflect the nature he loves. 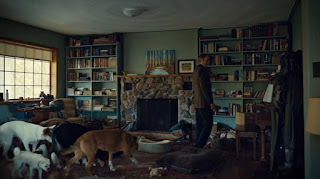 The materials in Will’s home are more mismatched and comfortable, and he tries to make his home a retreat from the horrors he sees in the world. And of course, his home is filled with his pets, which is part of what makes Will more humane (and human) than Hannibal will ever be. 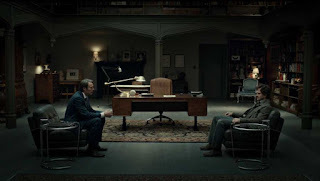 Here’s two chairs facing each other again, but in this scene Hannibal is out of step with his previously laid plans, so he’s not quite ready to sit and face his psychiatrist, Bedelia. Bedelia’s home is softer than Will’s or Hannibal’s. The velvet of her chairs, the cozy carpet, and the fluidity of the drapes are warmer and more inviting. 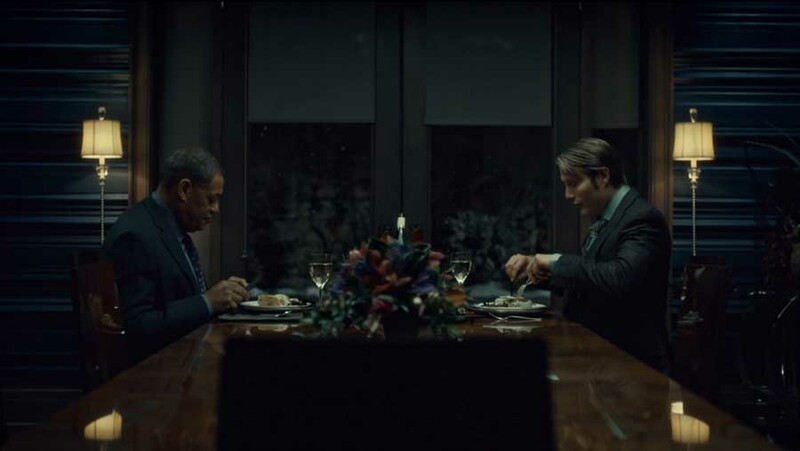 Bedelia’s chairs and Hannibal’s chairs are similar shapes, but their fabric is different and that's what is important. Bedelia and Hannibal may present themselves differently to the world, but their cores may be more similar than it seems at first glance. 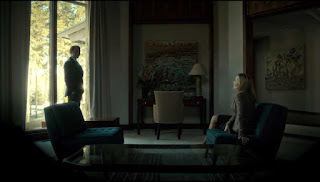 As Bedelia lives with Hannibal this season, it’s likely we’ll see more about what exactly makes up the core of Bedelia, and how similar to Hannibal she really is. As the show got darker and darker last season, scenes that looked like they could be straight out of a horror movie were used more frequently. In the Baltimore State Hospital for the Criminally Insane, where Will was held for the murder of Abigail Hobbs, there are literally cages to hold the prisoners when they need to be interviewed. The metal and stones are cold and unforgiving, and the shadows create many places to hide. This season, Hannibal is on the run, and he’ll use his surroundings to help hide his true self. The more elaborate, the better for Hannibal, and I can’t wait to see what the show comes up with.